We're attending three festivals this summer (Geronimo, Corbridge and Just So) and absolutely can't wait. Now that our children are older we do let them have a little more freedom and festivals are the perfect place to let them experience this. We will always keep them in our line of sight however we won't insist on holding their hand the whole time. Something that plays on my mind is that they could easily get lost and separated from us (festivals are busy places!). Although they are sensible and I would hope they'd know what to do in this situation, anything I can do to help our reunion or feel less anxious certainly helps. We have kindly been sent some KoolioBandz to test out - they are available in ages 2-5 years or 6-10 years. The idea is, you register your child's band online with two phone numbers. 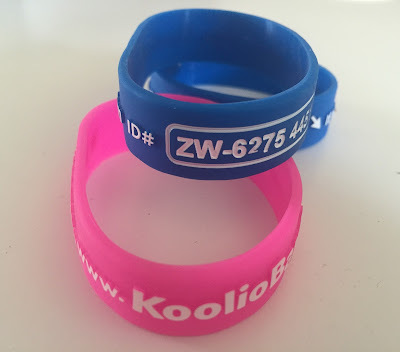 If your child is lost, an adult can follow the instructions on the child's wristband to send a text message (via KoolioBandz so everything is recorded and your phone number or personal details are never disclosed) alerting you where your child is. There is no subscription fee for this service and it works in 40 countries and languages. I like how language is no barrier and if a child is lost in say France, KoolioBandz will translate the message they receive into English for you. Kooliobandz cost just 9.95 euros for a pack of 2 which includes up to 5 text messages. You can buy them here or from Boots stores. The Make-A-Wish foundation will receive 45p for every band sold. The Make-A-Wish foundation receives no Government funding and every penny really does count to help grant 'One True Wish' to every eligible child. 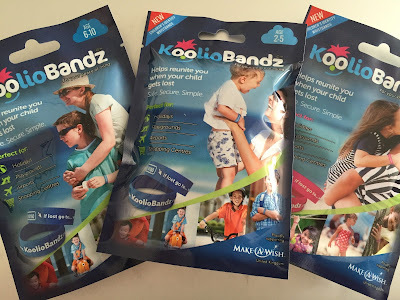 I've registered our bands (it took less than one minute) and our children will be wearing them whilst out and about this summer. Hopefully, I won't have to test the technology out for myself and obviously these bands don't replace vigilance or common sense but I am pleased to have this little extra reassurance and will explain to my three that they if they are lost they must not worry and find someone in uniform or a grown up with children and ask them to follow the instructions on their band which will reunite us in no time.